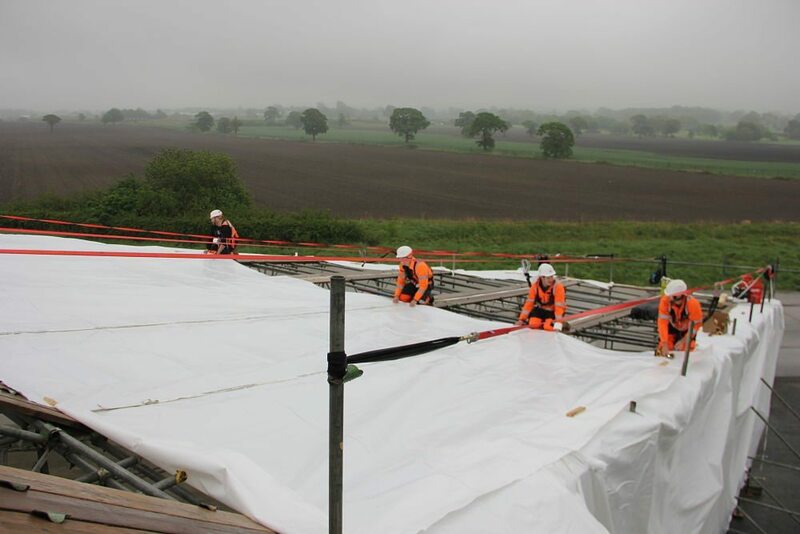 When a shrink wrap roof was required to protect an historic Vulcan bomber during restoration work, Rhino Shrink Wrap provided the materials and installation services to help ensure the project could be completed in dry and controlled conditions….. The Avro Heritage Museum, which opened in November 2015, is situated on the site of the old Woodford Airfield in Woodford, Greater Manchester. The airfield, which closed in 2011, has a long & illustrious history – 7377 of the famous Second World War Lancaster Bombers were assembled here and Woodford also manufactured the iconic Vulcan Bomber which was operated by the Royal Air Force from 1960 to 1993. Originally developed to deliver Britain’s nuclear deterrent, (crew were on permanent standby to take off in just 2 minutes in the event of a Soviet attack), the Vulcan was a revolutionary aircraft for it’s time and it’s delta winged design and distinctive sound make it an iconic and much loved aircraft. Although 135 Vulcans were built, many were broken up after the Vulcan left active service in the 1990’s. At The Avro heritage Museum, Vulcan XM603 is being restored by a dedicated team of volunteers. Without a hanger, carrying out the repairs and repainting the aircraft even during the summer months would have proved very difficult. The museum contracted Climb It Scaffolding Ltd., also from Manchester to construct a scaffolding around and a temporary roof over the Vulcan and Rhino Shrink Wrap were contracted to completely encapsulate the roof and sides of the scaffolding structure to provide a dry and controlled environment for the work to take place. Our teams started by hanging the scaffolding shrink wrap around the sides of the structure. The side sheeting is overlapped on to the top edge of the roof and ‘tacked’ into position using small wooden battens. For this project, the height of the scaffolding was only 2-3 lifts (4-6m or 13-20′) which meant that the entire ‘drop’ of the scaffold structure could be covered in a one sheet. If the scaffolding had been more than 3 lifts high then it is normal practice to fix the shrink wrap to the scaffolding every 6m vertical height and begin a new drop. Why start by hanging shrink wrap around the sides of the scaffolding? The main reason is that if the sides are hung first, the shrink wrap sheeting which is used to cover the roof will overlap the sides like a roof tile and joints between sheets should not leak. Hanging the sides also creates a wind break which makes it easier to fix and in particularly heat shrink the roof sheeting drum tight. Next, the roof sheets were rolled out. Individual sheets are overlapped by around 30cm and heat welded together. Around the perimeter of the roof, the roof sheets are heat welded to the top edge of the side sheets. Once the shrink wrap has been fixed around the sides and over the roof of the scaffolding and all sheets have been heat welded / joined together the final part of the process can begin – heat shrinking. The heat shrinking part of the scaffold shrink wrap process involves using a gas shrink wrapping gun to shrink the sheeting ‘drum tight’. the installers try and cover all parts of the sheeting to create a smooth, tight covering that will not flap and detach like traditional scaffold sheeting. The main challenge faced in erecting the shrink wrap sheeting over the roof and sides of the scaffolding which covered the Vulcan bomber was the weather. On day 2, when the roof sheets were installed over the starboard wing of the Vulcan it was very wet. 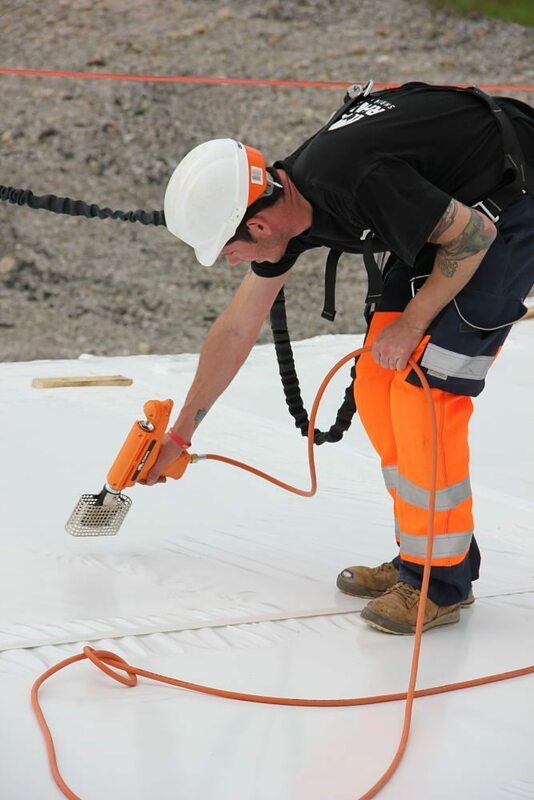 Rain is particularly a problem when installation a large temporary shrink wrap roof because a large roof will require that individual sheets of scaffold shrink wrap (which are typically 7m wide x 15m long) will need to be heat welded / sealed together. In wet conditions, it becomes difficult to get a very effective heat welded joint between two sections of scaffold wrap. Although it may appear that the sheets have been bonded, this bond will not be as strong as a weld created in dry conditions. The best way forward is to wait until dry conditions but if this is not practical then it is necessary to try and dry the overlapped area before starting to weld them together. On day 3, the rain had stopped but now the wind speed had increased! The wind can make hanging sheets much slower. 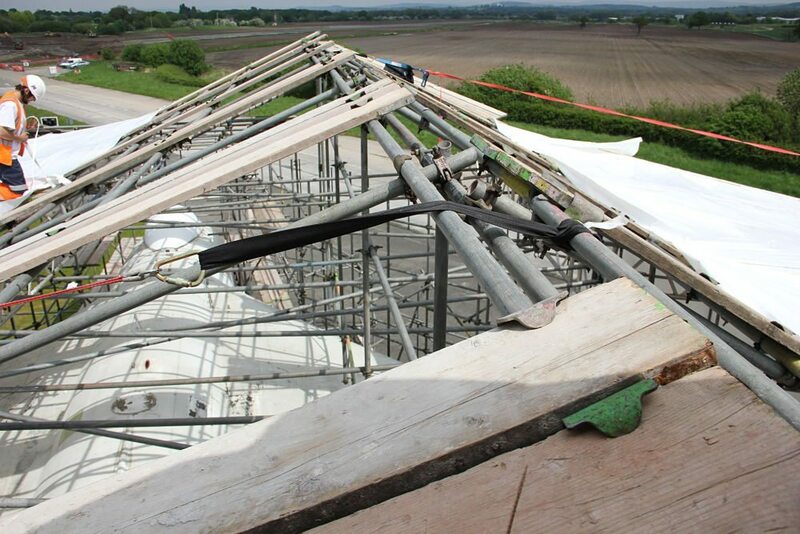 For the installation of the largest roof sheets our teams attached heavy duty strapping to the scaffolding and unrolled the roof sheets underneath these straps to keep control of the shrink wrap sheeting. However, the main challenge with wind is that it becomes very difficult to shrink the sheeting ‘drum tight’. 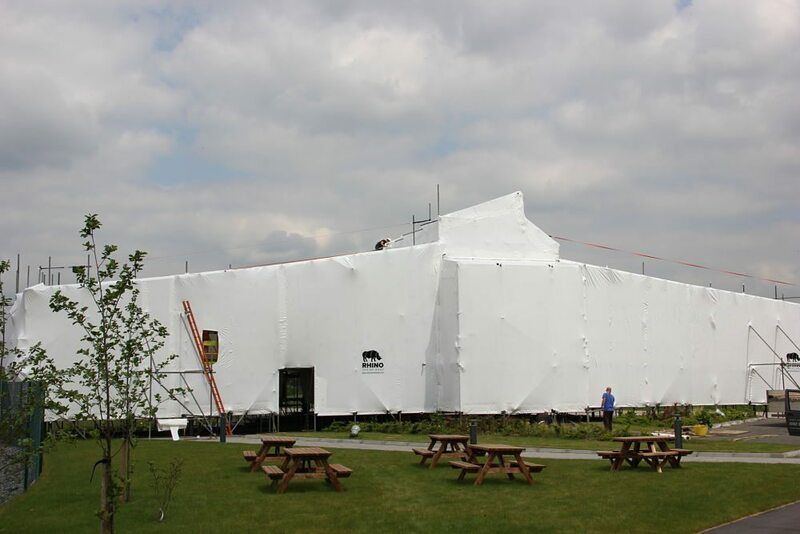 Instead of the sheeting, shrinking down and creating a smooth, glossy and tight surface, as the wrap is heated it momentarily becomes very soft and supple and in windy conditions may be blown into a large bubble. In these kind of conditions, it becomes necessary to heat a very small area, let it shrink, heat another area, let it shrink and so on. This technique, often known as ‘spot shrinking’ can work but it is time consuming. 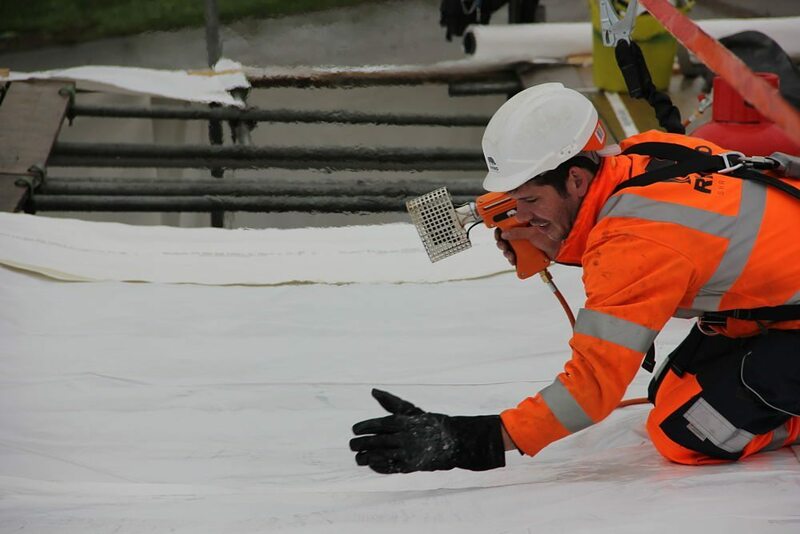 For this project our teams returned on the final day, when the winds had dropped to finish the shrinking process, which in the right conditions is the quickest and easiest part of the entire process of creating a temporary shrink wrap roof.